The Lift condos for sale are located at about 2 o’clock on the loop called Columbine Drive in the Four Seasons section of the Warriors Mark neighborhood. The base of Peak 9 of the Breckenridge Ski Resort is due west and is a quick hike in summer or a short skate in the winter. The woods around the loop have been preserved in this neighborhood and makes for a pleasant walk to the nearby pool. 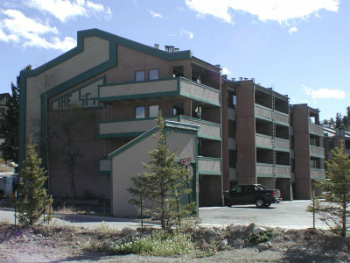 The free town shuttle stops just outside the door and makes everything in Breckenridge easily accessible from any condo for sale in The Lift. Start your search with the available Lift condominium listings below, or discover more about the surrounding neighborhood. The Lift is similar to other condos built at this time in this neighborhood, but this complex is one of the larger ones and offers a variety of sizes, views and different levels. The complex is heated by a central hot water system. Most of the units have a balconies, and the top floor have additional loft space. The view of the Ten Mile Range can be good from many of the Lift condos. Maintained trails make it easy to ski over to the Village at Breckenridge, which contains the base of Peak 9. In the summer, footbridges across the Blue River are more obvious and will lead to national forest and the Village. The Maggie Pond is due west, and the center of downtown just a block to the north. All the condos on the Columbine Loop share use of the Columbine, or Four Seasons pool and clubhouse, which has an outdoor heated pool and several hot tubs. Size: 805 to 1454 sq. ft. Located in the Columbine Loop in Warriors Mark, across the Blue River from the base of Peak 9, just east of the Columbine neighborhood pool. Drive south on Main Street to last stoplight at Boreas Pass Road, turn right on Broken Lance Drive. At the three-way stop make a right on Columbine, and at 12 o’clock on this loop, turn left on Snowberry Lane. This takes you to the parking for the Lift Condos on the left. We are the Breckenridge real estate experts! Contact us today to find out how we can help you to navigate the local real estate market.